Our Master Grooming Tools Ergonomic Comb was designed with hardened steel teeth that are positioned at a 90-degree angle from the pistol grip handle, keeping your wrist straight during use. 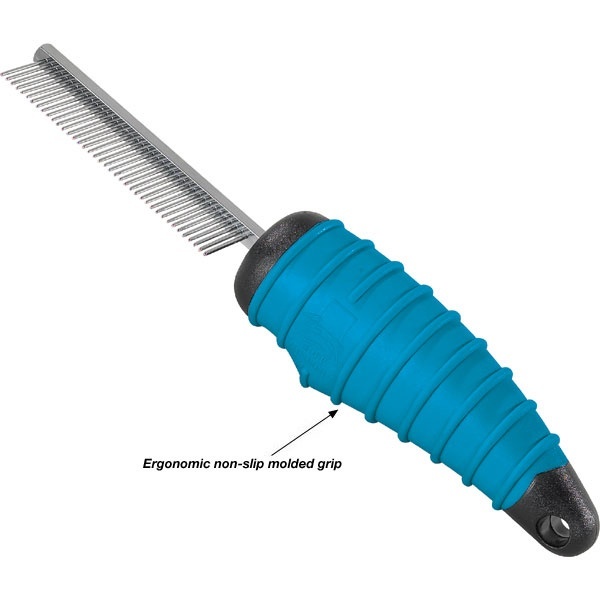 This Ergonomic Comb was designed by groomers specifically to increase comfort and reduce the risk of repetitive motion injury as repeated bending and snapping of the wrist during grooming causes stress and strain on the muscles and joints. Innovative pistol grip handle is shaped to fit the contours of your hand. Handle is covered with ribbed rubber for a comfortable and solid grip. Experience less pain and fatigue while combing out knots and fluffing the coat.